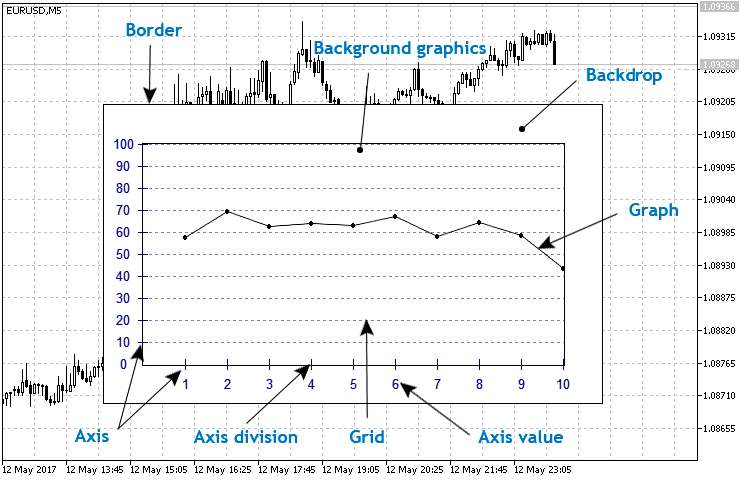 Custom indicators form an integral part of modern MetaTrader 5 trading. They are used both in automated trading systems (as part of the algorithms) and in manual trading. By now, it has been possible to set a drawing style and apply 18 types of graphical plotting when developing an indicator. But the platform features broader graphical capabilities. The CCanvas custom graphics library allows developing custom non-standard indicators with infinite visualization capabilities. This article introduces readers to the library features and provides examples of its application. A separate library of custom indicators is developed as well. To develop a base class, we need to write a set of methods creating the foundation of any custom graphics object and including a common set of properties. To do this, create the CanvasBase.mqh file in the CustomGUI folder of the <data folder>\MQL5\Include directory. This file will contain the CCanvasBase base class for all future types of custom graphics. As we can see, the initial object coordinates, name and size are complemented with the graphical resource creation and deletion methods that form the foundation (canvas) the custom graphics elements are plotted on. Further on, CreateCanvas() and DeleteCanvas() methods are to be applied during the initial construction of any graphical object at all times. Therefore, the variables used in these methods should be initialized, like it is done in the constructor. Let's use the "simple-to-complex basis" in order to grasp the principles of developing custom graphics. 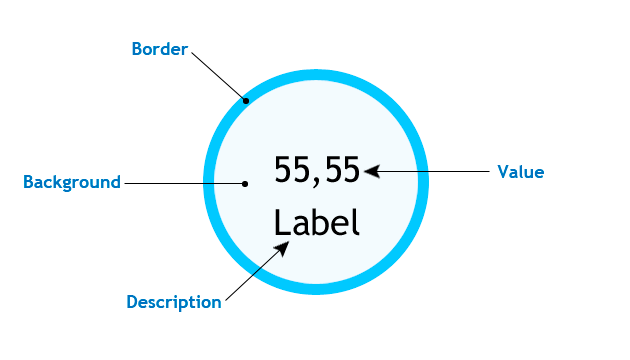 First, we are going to develop a simple circular indicator featuring a frame, numerical value and description. The Fig. 1 shows the structure of the basic elements. Frame (border). An outlined edging. Background. The space the text elements are located in. Value. A text element displaying a numerical value. Description. Indicator description text (name, period and other distinctive information). Let's create yet another folder and name it Indicator in the previously created CustomGUI one. The folder is to contain all classes of future indicators. Create the first one named CircleSimple.mqh. First, we need to include the previously created CanvaseBase.mqh file to the base class for all types of graphical objects and make the CCanvaseBase class basic for the current one, so that all methods of the class are available for the current CCircleSimple. This is convenient because when you create an indicator of that type, you just need to create an instance of its class and use the CreateCanvas () method only. Before creating, you can specify only the properties you want to change. When constructing complex graphical objects using the CCanvas library, keep in mind that methods implementing primitives are drawn sequentially and in layers. This has much in common with an actual canvas. First, artists usually draw a background, then they portray objects which in turn are followed by details, etc. 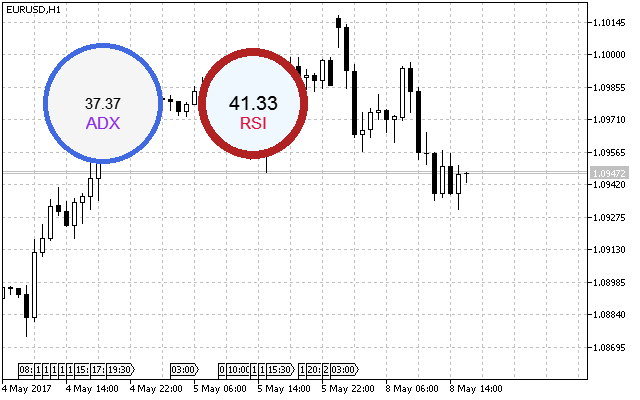 First, adjust the location of the graphical resource relative to the actual indicator size, so that it does not go beyond the main chart. Then, use the setting and work with the name, size and coordinate methods. The foundation is created from the CCanvasBase base class. When implementing the frame, we used the superimposing principle described above. In particular, we have created the two circles: the first one (filled) and the second one with its radius lesser than the first circle's one by the value of the frame width. Numerical value and description elements are created above these objects. 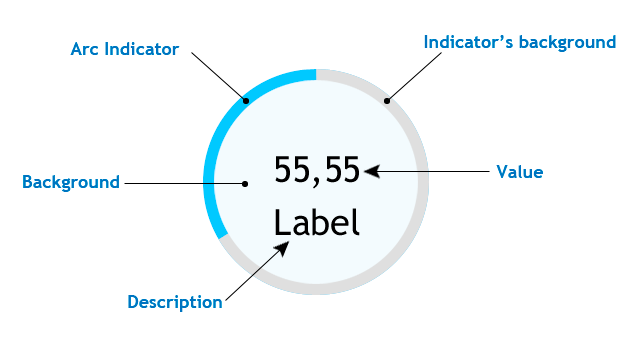 In order for the indicator's numerical value to update correctly, we need to re-draw the three objects (background and text elements) in the same order as when creating them. Therefore, the background is re-drawn in the NewValue() method followed by value and description text elements. #property copyright "Copyright 2017, Alexander Fedosov"
The only thing left to do is writing the methods for deleting graphical resources in the deinitialization, so that graphical objects are deleted correctly when the indicator is removed. The results are presented in Fig. 2. As we can see, the indicators differ significantly from each other in many parameters. We have considered a class providing the simplest form of implementing a circular indicator. Let's slightly complicate the task and create a class having an additional graphical display element besides the numerical one – an arc. The structure of the basic elements of the indicator with an arc indication is provided in Fig. 3. Thus, we add the future class to the overall list of inclusions of all indicators. Define the set of common properties and methods. They are not different from the previous class methods, however it is worth considering the ENUM_ORIENTATION enumeration. It has two values (VERTICAL and HORIZONTAL) and defines the location of the first arc border of the arc scale. If the value is vertical, the arc starts at 90 degrees and if it is horizontal — at zero. The indication is counted counter-clockwise. Arc indicator background. As a filled circle. Arc indicator. As a filled ellipse sector. Text background. As a filled circle. Indicator numerical value and its description. After checking and setting the initial positions, the angle is re-calculated in radians of the second arc border. After that, all indicator elements are redrawn with new values. As an application example, we have developed a simple spread indicator, which changes the indication arc scale color when reaching the threshold value. As we can see from the listing, the implementation using the CCircleArc class is quite simple to create and configure. Keep in mind that the properties should be changed and configured only before the indicator is created (Create() method) or before using the NewValue() method. Since these are the methods, in which the indicator elements are re-drawn and changed properties are applied. Spread indicator is shown in Fig. 4. Unlike a simple arc indication, the sectional one looks as if it has labels separating equal intervals. When creating a layout of the indicator of this type, I have decided to make ten sections and add a new element – the inner frame. The basic structure with the arc sectional indication is presented in Fig. 5. Displaying the arc indication with sections is completely different from the previous class, which is marked with one-time use of the Pie() method of the CCanvas library. In this method, the location of the second ellipse sector arc is modified when the value changes. Here, this method is applied ten times, and the arc locations remain static. 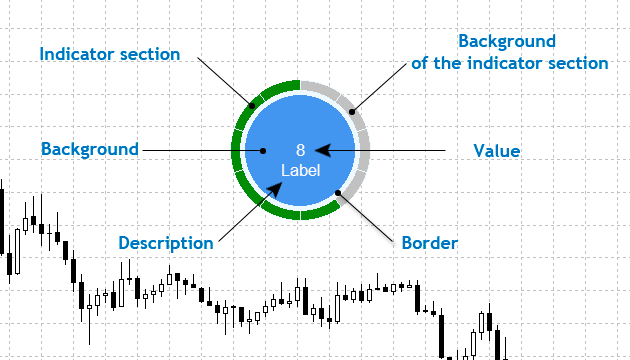 Simply put, the indicator features 10 filled ellipse sectors following each other in a circle. Certain sections changing their colors serve as a visual indication. The Create() and NewValue() methods are left since their implementation here is different from the previous ones. As we can see from the listing below, correction of the location relative to the radius is followed by the block for creating ten sections using a cycle. The starting point is considered: horizontal – from zero degrees, vertical – from 90 degrees. As we can see in the listing above, the implementation looks quite simple. The current value is checked relative to the maximum one. If it exceeds or becomes equal to the maximum value divided by the number of sections and multiplied by the current cycle iteration, the section color is changed from non-active to active. As an example of using the class, I have implemented the drawdown indicator that displays the ratio of the equity to the current account balance. Thus, we can visually manage the drawdown on the account instead of tracking the numbers in the platform. The listing of the implementation of such an indicator is presented below. 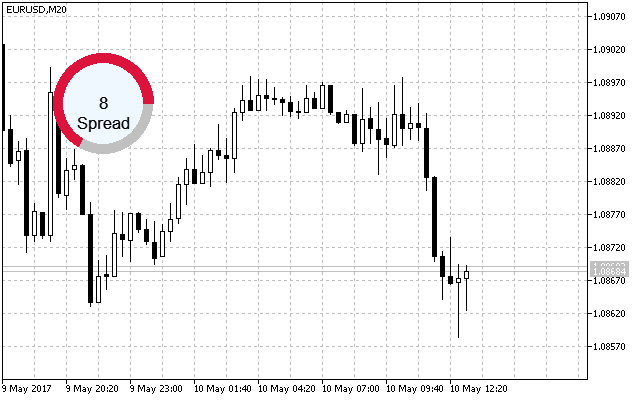 Do not forget to use the Delete() method in deinitialization to delete the indicator from the chart correctly. Graph backdrop. It is to have two features: size (which also the size of the object itself) and color. Graph frame. Only color. The element consists of the two filled rectangles. The coordinates of the last one (which also serves as the graph background) are shifted by one providing the frame effect. Graph axes. Only color. Implemented the same way as the graph frame by overlaying two rectangles, where the upper one shifts the coordinates by one. Axis scale. Only color. Set of lines implemented using the LineHorizontal() methods for Y axis and LineVertical() for Х axis. Axis value. Color and font size properties. Set of text objects using the TextOut() method. Grid. Only color. The LineAA() method is selected for implementing the grid, since it allows to set the line style. Graph. Only color. The element consists of line and filled circle — the FillCircle() method. Only customizable properties are specified in the elements description. Fig. 6 displays the graph elements structure. Then, create the CLineGraph class in the LineGraph.mqh file and make CCanvasBase the basic one for it, like the previous ones. Define all properties and methods described above in the basic structure of the linear graph. Let's have a closer look at the implementation of the methods that are not specified in the above listing. The Create() method is used to create a graphical resource, which is then placed on a symbol chart. The two private methods for setting the vertical and horizontal scale are used here as well: either based on initialized settings in the class constructor or using the class methods before creation. 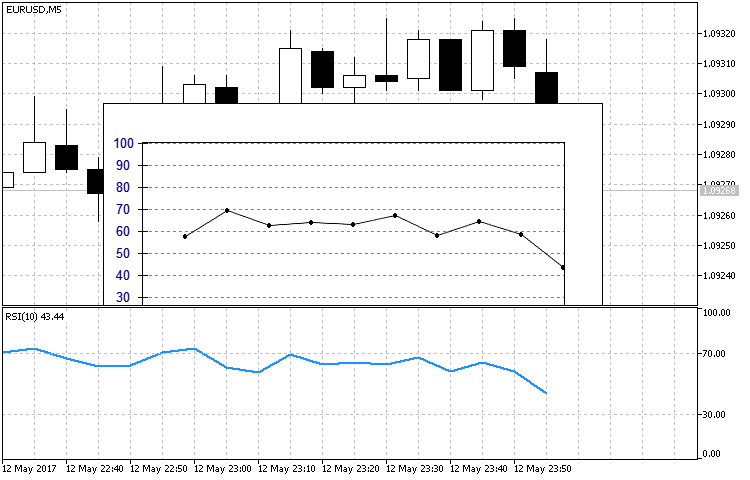 In order to display a linear chart, it is reasonable to use a data array as a basis, since MetaTrader often applies arrays for copying values from indicator buffers. When implementing the SetArrayValue() graph display method, the data array is used as a basis (method arguments), where the values corresponding to the array size are set on the X axis and the array values — on the Y axis. //--- If the maximum data array value exceeds the upper Y border, the axis is scaled. As an example of the class application, I have developed a graph based on the selected oscillator values and compared with the original display. The standard RSI has been used for that purpose. The listing below shows implementing of construction based on the buffer values using the ClineGraph class. Note that the array the data is written to using the CopyBuffer method should have the original form. Unlike time series, no indexation change is required. In this article, we have dealt with step-by-step creation of custom indicators of an arbitrary form with the help of the CСanvas custom graphics library. We have also analyzed examples of various complexity – from a simple circular indicator consisting of only four elements up to a circular one with sectional indication. Besides, we have considered the implementation of the already known indicator types in a new way. As we have seen, the options are not limited by a rigidly defined set of properties. The implementation examples have been structured as classes, i.e. they are a supplement or extension of the already complete CCanvas class. The attached archive contains all the listed files, which are located in the appropriate folders. For a correct operation, you should save the MQL5 folder to the terminal's root directory. This article discusses the implementation of money management method for a cross-platform expert advisor. The money management classes are responsible for the calculation of the lot size to be used for the next trade to be entered by the expert advisor. The article considers the ideology and methodology of building a recommendatory system for time-efficient trading by combining the capabilities of forecasting with the singular spectrum analysis (SSA) and important machine learning method on the basis of Bayes' Theorem. This article discusses the implementation of various methods of time filtering a cross-platform expert advisor. The time filter classes are responsible for checking whether or not a given time falls under a certain time configuration setting. The article considers new types of indicators with more complex structural implementation. It also describes the development of pseudo-3D indicator types and dynamic infographics.